The province is supporting a partnership between the Kainai First Nation and The Rockies Institute that will boost climate change education, research and planning in the community. Minister Shannon Phillips, the Kainai First Nation and The Rockies Institute discuss a new Indigenous climate change program. The Rockies Institute is a charitable organization that combines knowledge and best practices from around the world to inspire innovative responses to climate change. 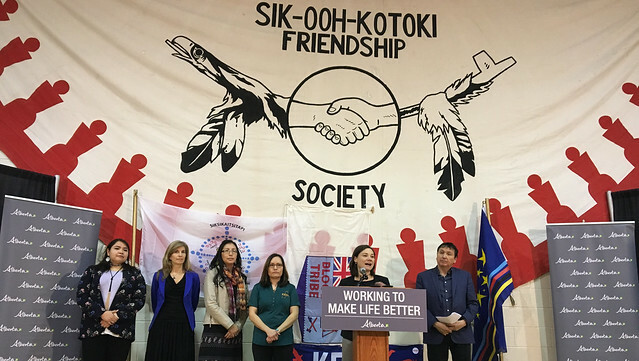 The Kainai First Nation will use a grant, funded by Alberta’s Climate Leadership Plan, to work with The Rockies Institute to better understand climate change and how it affects Indigenous peoples within the Blackfoot Confederacy. The $230,000 grant will support the Building Climate Resilience and Adaptation in the Kainai First Nation project, which includes climate education sessions and opportunities for elders and youth to connect and learn about how climate change affects botany and food security. The funding has already allowed the Kainai First Nation to hire an internal climate change coordinator, Diandra Bruised Head, and will help The Rockies Institute design and deliver an adaptation plan that includes research and recommendations for adjusting to a changing environment. The Building Climate Resilience and Adaptation in the Kainai First Nation project directly supports the provincial government’s efforts on climate change mitigation and adaptation, and will provide crucial insight for future policies and strategies that are more informed, compassionate and community-aware. Alberta’s Indigenous communities have shown a keen interest in climate adaptation and research. In 2015, Alberta’s Climate Leadership Advisory Panel held engagement sessions with 48 First Nations. The resulting Climate Leadership Report spoke to the reality that Indigenous communities experience the impacts of climate change more directly due to location, economic conditions and heavier reliance on the environment. The report recommended that climate leadership revenues be used for projects like Building Climate Resilience and Adaptation in the Kainai First Nation.